Excellent Readability: Epina pixLibris products work with an antialiasing method. This ensures that scanned pages stay highly readable when being enlarged or reduced. Navigation: pixLibris products feature a variety of navigation aids, making it easy for the user to find specific information: table of contents, browse sequences, "see also" links, keyword indices, full text index and timelines. Furthermore, it is possible to create hyperlinks within the scanned pages (see below). Printing: the user can print pages directly from the digital book in a quality resembling the original. Individual Configuration: various elements of the user interface (eg. buttons, titles, hints) can be altered in form, colour and text to create a layout according to individual needs. CDROM/Network: pixLibris products can be distributed either on CD-ROM or via network (in-house LAN, or Internet). Offline Users: users with access to a network version of a pixLibris product can create an offline-copy which does not cause further online costs. Naturally, offline copies are just as secure as the online versions (personalisation and authentication). Demo Copies: pixLibris offers the possibility of creating demo-versions of limited accessability. When bought by a customer, the demo-version of a book is activated and personalised through a license code without re-loading from the server. Personalization: the pixLibris technology offers to personalize each book, for example by displaying the customer's name and address on the first page. Sale and personalization of pixLibris products is automatically workable via e-commerce-systems, e.g. the Epina online shop. Note that pixLibris uses a special method of personalization, where personal data is not entered by the customer, but linked to the license code instead. This process prevents users from passing on pixLibris products under false names. Server Requirements: network versions of pixLibris products do not have any special server requirements (no extra cost). Hardware/Software Requirements: PC-compatible: at least 300MHz clock, Windows 98/ME/NT/2000/XP, recommended resolution 1024x768 (required 800x600). Links in Scanned Pages: up to 100 areas on every scanned page can be colored and marked as links to other pages, causing the book to behave like Web sites. Full Text Index: pixLibris features a full text index of all scanned pages. This allows to search the whole book for specific words (or a combination thereof), making it an extremely useful tool for searching through specialist literature. Contents: pixLibris pages are organized in a hierarchical tree of contents. Each subtitle opens a pop-up menu. Index: it is possible to define up to eight specific indices, which search for a list of names, terms or subjects separately. It is up to the customer to decide how he wants to use these indices. Data Compression: the data on each page of the pixLibris book is optimally compressed and requires little memory (50 Kbytes for a black and white page), reducing access time of the online version. Encryption of Documents: the encryption of pages prevents theft by making it pointless. Furthermore, the personalization of pixLibris products (see above) efficiently prevents pirated copies as the originator can be identified easily. 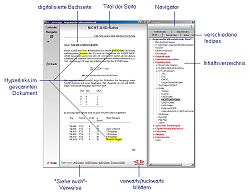 Supporting more than 30 Document Formats: it is possible to add a large variety of extra material to the scanned pixLibris pages (photographs, videos, Web sites, text, etc.). By making use of this advantage, books which lack digital models can be updated or enhanced efficiently. Coimbra as a Powerful Development System: the pixLibris technology prides itself in being based on Coimbra, one of the most competent development systems for digital books.